There are many shapes, sizes and colors of eggplant. They may be green, purple, white striped with red or lavender. The Asian varieties are slender and elongated while the North American and European varieties are oval and elongated. The raw fruit can have a somewhat bitter taste, but becomes tender and creamy when cooked and develops a rich, complex, sweet flavor. The cream colored flesh is a sponge for oil and fats. Salting, then rinsing and drying the fruit before cooking is said to remove some of its bitter properties and helps reduce the absorption of oil and fats. 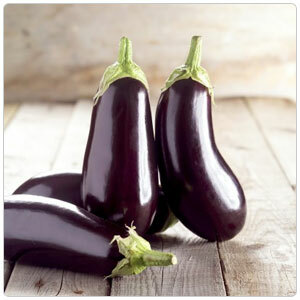 Eggplant is often stewed, as in the French Ratatouille or in the Italian Caponata. Eggplant can also be used in gratins, pastas, pizzas, soups, purees and sandwiches or Panini and can be grilled, sautéed, breaded and fried, baked, stuffed and braised.